Cannabis is abundant in the world of creativity, and creativity is abundant in the world of cannabis. So it comes as no surprise that dispensaries are often colorful and artistic centers rather than dull, sterile environments. 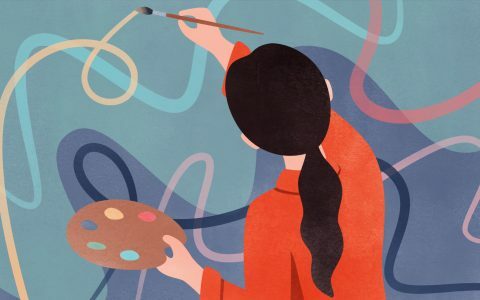 All over the country, cannabis shops are putting emphasis on design, which means supporting artists by hiring them to design beautiful murals that cover their buildings or flush the walls within. 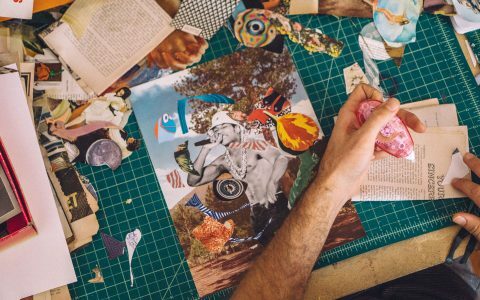 Below, check out 10 dispensaries across the US showcasing art and cannabis in a bold and unique way. Aptly titled, Port of Oakland, this unique mural offers realism and a homage to Magnolia Wellness’ location near Western Oakland. 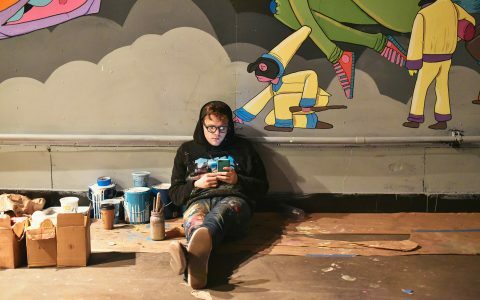 The mural possesses immense depth within simplicity, and the cool, blue color palette was chosen to encourage patrons to “relax, sit back, and enjoy the details,” as Avgustinovich says, adding that it can help people forget they are in the middle of a city. In addition to this piece, Avgustinovich also added beautifully detailed magnolia flowers on the walls around the shop to tie the art back to the dispensary’s name. This stunning mural is inside Urban Treez dispensary in Los Angeles. Painted by artist Matt Dean (also known as Kiptoe), it features stylized exposed brick and an “urban weed forest” complete with a fierce lion-shaped nug. Covering two walls, the mural’s theme was inspired by the dispensary’s name and Dean’s creative flair. 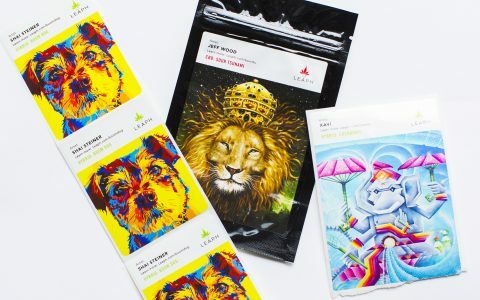 Dean has a BFA in illustration but finds “the mural medium the most gratifying.” This is fortunate for L.A.’s dispensary scene, as his art can now be enjoyed by all who enter Urban Treez. A mural with a sense of humor is what you’ll find at The Station in Long Beach, California. Levity was necessary for this dispensary (which used to be a police station), and how better to grant that levity than with a mural playing off the space’s past, present, and future? This impressive 20×30 foot scene features police men at a train station, with “a kaleidoscopic rainbow spotlight from rays of sun streaming in from the faux windows above them, signifying freedom. The impressive mural features geometric patterns and a loving embrace. 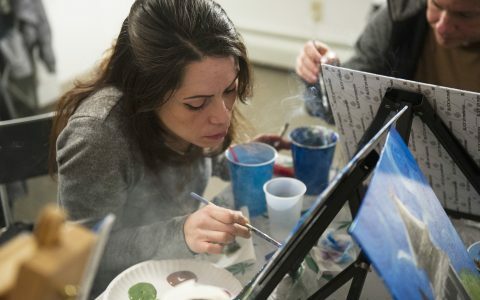 We got another big #cannabisart painting day going on. Stay tuned for finals! MOCA, or the Modern Cannabis dispensary, would be simply amiss without a homage to art, as its name is a play on MOMA, the Museum of Modern Art in New York. Artists were commissioned for a mural project at the dispensary and were asked to paint a section of the wall with a cannabis plant inspired mural. Artists such as Keith “Afrokilla” Smith were then allowed to apply their own creative spin on the subject. As a result, the dispensary features an art gallery with artist’s unique interpretations on the cannabis plant. A stunning work of art contributed by art agency ISI Group, this beautiful mural sits on the outside wall of Acres Cannabis in Las Vegas. The three sections feature bright, vivid colors and evocative images of women, birds, flowers, and mandalas inside gold painted frames. It’s refreshingly unique while also displaying the signature style of ISI Group’s work. What does this image recall for you? This impressive and fantastical mural covers the storefront of Alternative Solutions in Portland, Oregon. An overgrown, mystical looking forest complete with riverbed and gnarled trees makes it look as though one is about to walk into a fantasy novel rather than a dispensary. Don’t let the creature lurking above the door give you pause, because through the painted tree a selection of flower awaits. 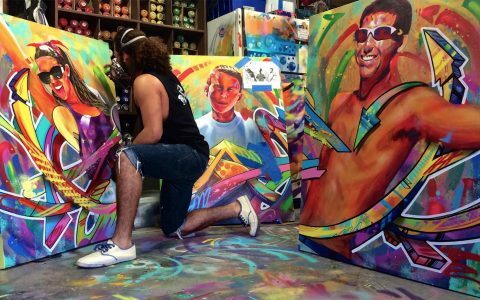 Artist Gonzalez has a wide range of projects, from murals, to street art, and they all encompass his vivid, imaginative style. 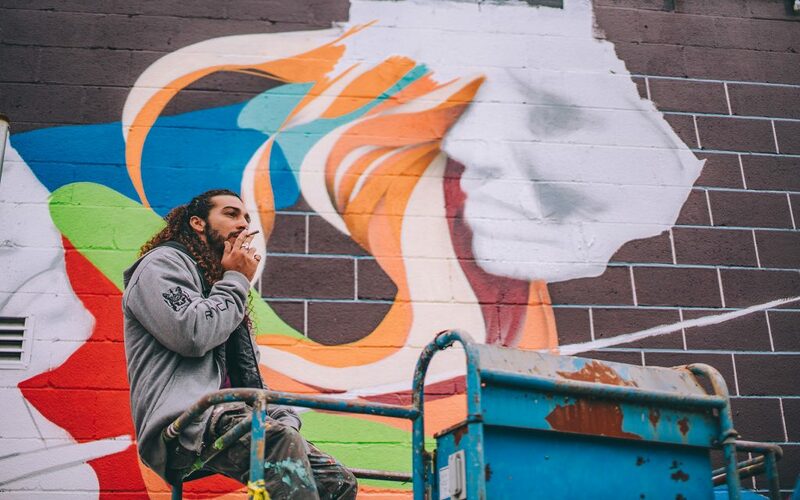 Located just outside Philadelphia, this medical marijuana dispensary in Elkins Park hired Philadelphia-based graffiti artist Jimmy “Glossblack” to paint a mural inside the store. The mural sits behind the counter and adds a pop of urban style and color to the modern décor of the dispensary. Insta ain’t big enough 💥 My latest massive mural “Strength of Strains”! The 20′ x 110′ wall in collaboration with @leafly and @dp_washington! Thank you to everyone involved! 👀 Catch me in the middle for a size perspective! The colorful mural covers a space equal to that of 10-stories, making it one of the most impressive on this list. If you’re in Seattle, stop by Diego Pellicer to check it out. Legends is a whimsically colorful mural at Herban Legends in downtown Seattle. Robinson’s cartoonish and playful style provides fuel for the imagination, even when featuring common characters such as The Caterpillar from Alice in Wonderland. It’s total eye candy for all who walk through this dispensary’s doors.